Hello. I'm stretching my horizons a bit with this outing: a three day canoe trip in the wilderness of Eastern Algonquin Provincial Park. The origin of this adventure came from work colleague Arn, who does an annual spring canoe trip in the park. He invited Jenn and I on the 2012 incarnation of his trip, but scheduling conflicts prevented our attendance. This year, Jenn was again busy, but I was free, and so I decided to tag along. It was about time I did a trip like this. As any follower of my website knows, I've little experience with water-based adventure. 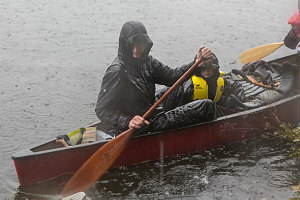 Although I have done some limited canoeing in the past, it has always been of the short, try-it-for-an-hour-or-two variety. 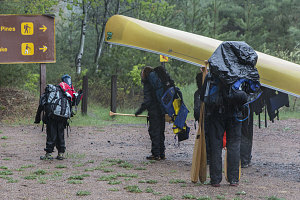 This was more involved - a multi-day trip involving portaging, camping, and river navigation. Arn's planned outing this year was a trip along the Barron River drainage in the eastern sector of the park. 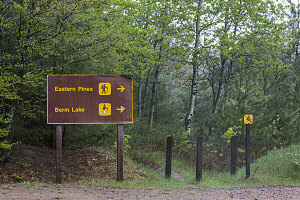 The trip is a popular one, following a chain of lakes at the start and narrowing down to a portage-filled run down the Barron River, including a very scenic section known as the Barron Canyon, a feature where the river runs through a canyon-like feature with high walls on either side. 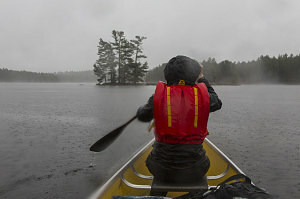 Algonquin Park's lakes and rivers are only ice-free starting from about the end of April. Arn schedules his trips soon after this, typically on the first or second weekend in May. The crowds are minimal, the bugs yet to arrive. But the weather can be fickle, and although Arn's 2012 outing had had beautiful weather, as the day of our departure approached, the forecast was not a pretty one: after an extended bout of clear and warm weather, the upcoming weekend was scheduled to be unseasonably cold, and on top of that, rainy. 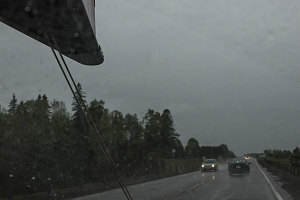 So, that's how we came to be driving west on an early May Friday afternoon out of Ottawa on highway 17, with the first few flecks of rain hitting the windshield and a dark leaden sky ahead of us. 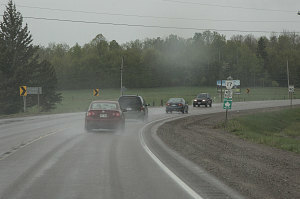 By the time we had reached the town of Arnprior, the flecks had developed into drizzle, and then into a continuous heavy rain. Although we were warm and dry in the car, we knew that the next few hours would put our synthetic clothes to the test. Cold and rain can be quite unpleasant, if not downright dangerous, without the right gear. I always bring my heavy DSLR camera gear on any outdoor outing I do, and this time was no exception. 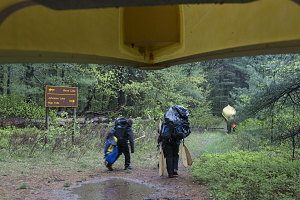 However, a water-based trip like this brought new requirements: namely, the protection of expensive gear from the possibility of being completely submerged in water, something not really an issue on hikes. When I decided to accept Arn's invitation on this trip, I immediately started casting about for a solution that would allow me to safely use my camera while on the open water. I discarded the possibility of using heavy-duty professional diver's camera cases, which often cost more than the camera itself, as well as the simple camera-in-a-ziplock solution, which seemed far too flimsy. After much searching, though, I discovered a product (brand name Outex) that encases the camera in what is essentially a thick latex glove, with waterproof portholes for the lens opening and the eyepiece. As we drove towards Algonquin, the heavy rain outside was an extra encouragement to begin the process of getting my camera safely wrapped up. 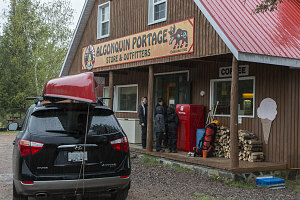 An hour and a half or so of driving brought us to the doors of a outfitter's shop along the Barron Canyon Road, not far from the Sand Lake Gate entrance to Algonquin Park. Although Arn had his own canoe, we needed to rent two more in order to have enough capacity for our entire group, which at this point I suppose I should mention: along on this trip besides myself were Arn and wife Gosia, their two kids Kai and Nel, and friends Nancy and Dave and their daughter Emma. Eight of us in all, requiring three canoes. The temperature was five degrees celcius as we disembarked at the outfitter's store. The rain was steady and cold, and we spent the first few minutes fishing out layers of insulation and upper and lower waterproof shells. To not do so was to invite an immediate attack of the shivers. 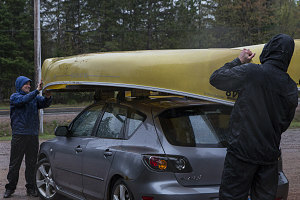 Arn and Dave handled the registration logistics and installation of the rental canoes atop Dave's Mazda 3, and eventually we were off, headed west along the road towards the park. We soon stopped at a park office at the Sand Lake Gate, where we bought our permits for our three-day outing. The start of our journey was from the Achray Access Point, forty-five more kilometres down the Barron Canyon road. Achray is a major campground and starting off point in this, the eastern portion of the park. 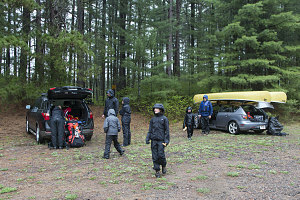 Our attempts to prepare our gear underneath the tailgates of our vehicles at the trailhead seemed a bit futile, knowing that the forecast of continuous rain for at least twelve more hours meant that they were surely going to somehow get soaked. In anticipation of the canoeing, I had stuffed all of my most important belongings - namely, camera gear and camping gear, into dry sacks inside my pack. Time for the adventure to begin! Arn's plan for our journey was divided into three segments. The first segment - the Friday night segment - had us portaging in three-quarters of a kilometer to a put-in point on Johnston Lake. From there, we would canoe a very short half-kilometer to a canoe campsite on the shore of the lake, and set up camp for the evening. 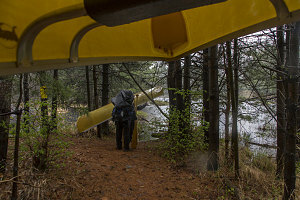 The next day involved a longer but still easy 8-ish kilometer canoe to a campsite along High Falls Lake, and the final day - Sunday - a 15-ish kilometre shot along the Barron River and Canyon to our end point along the Barron Canyon road at Squirrel Rapids. The portage from the trailhead to Johnston Lake was the first real bit of portaging I had done (outside of a very short test run a few weeks before with Arn's Canoe). 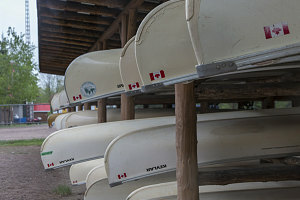 The experience was both good and bad; after a bit of an awkward struggle to get the canoe upside down and over me, the well-balanced yoke meant it was very easy to walk along with the canoe perfectly balanced overhead. On the downside, the way in which the weight was perched on my shoulders caused a very uncomfortable cutting of the circulation in my arms. 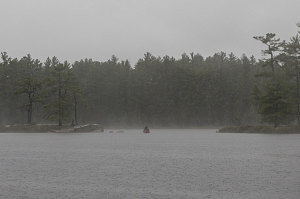 Although it was nice to have the canoe act as a glorified umbrella against the rain, I was glad when we finally came to the misty edge of Johnston Lake and I was able to put my load down. 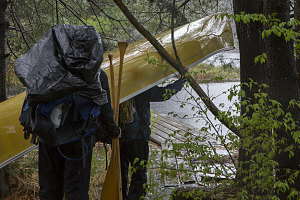 We quickly placed our packs into the canoes and cast off onto Johnston Lake. I was paired with Gosia for this short segment, and we glided out onto a misty slate of gray water. Although the rain wasn't welcome, there was a certain ethereal beauty to the scene. 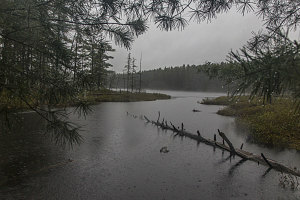 There was no wind, and apart from the little splashes kicked up by all of the raindrops, the lake was calm. Our layers of synthetic clothing and the exercise from lugging our gear from the trailhead meant we were actually a little overheated, and gliding out over the lake was not at all a bone-chilling experience. I dipped my hand into the water and it actually felt warm. No doubt the result of many weeks of warm weather coupled with today's cold air temperatures. Our initial intended campsite was partway down Johnston Lake, on its south shore. We soon spotted the tell-tale orange campsite marker and pulled up to shore. A quick look around, though, revealed that there wasn't much flat ground to accompany eight people and three tents. It would be a tight and probably uncomfortable arrangement. Arn soon suggested another campsite - just visible directly across the lake - as a potentially better alternative. Even from this distance it did appear to have a larger, flatter camping area. After a bit of indecision, we decided to go for it. We got back into the canoes and made a quick shot across the lake. It was a good choice - there was much more useable space. 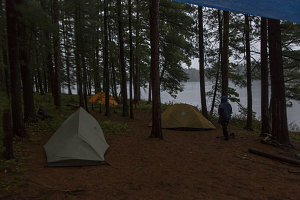 The first order of business was setting up camp - an unpleasant task in the pouring rain. To migitate this, we decided that we'd put up the tents individually, with four people holding a large tarp over a tent-raiser. In this manner, the tents got put up without a lot of extra water getting onto the inner bits. The next order of business was fire. Arn and friends are all about fire - rain or shine. A bunch of us were dispatched into the nearby woods to gather some deadfall from the previous winter, and soon, Arn and Dave were attempting to make combustion happen. The weather conditions made this a difficult proposition, though, and it took many tries for a good half-hour before Arn and Dave finally had a self-sustaining fire going. 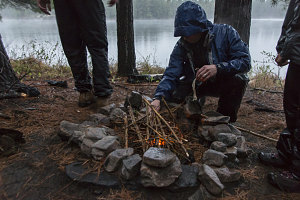 Although I'm not any kind of regular campfire-maker, I have to admit that it was nice to see a warm and cheery fire fight back against the wet gloom of the approaching night. With our tents set up and the fire going, we prepared dinner. Or, I should say, Arn and Gosia prepared dinner. I was graciously invited to share in Arn's family's camp meals, and tonight's dinner was a tasty combo of things. Specifically, it was Polish sausage cooked over fire with homemade closelaw with vinaigrette dressing, along with a fresh baguette with butter (with a special alteration for Arn, who substituted his sausages with a slab of steak). Very nice. Well above my standard camp fare, and with a warm and roaring fire as a backdrop, most delicious. After the satisfying dinner, we stood around the campfire, allowing our clothes to steam dry against the heat of the fire, and whittled away an hour or two chatting and roasting marshmallows and popcorn. We thought we noticed a slackening of the rain, but it was hard to tell in the dark whether this was in fact the case or just wishful thinking. The forecast was for only intermittent rain the following day. We retired to our tents for the night, hoping for the best.